Juliet's Balcony at Casi de Giulietta. Is Juliet's Balcony Real? Shakespeare’s stories are so rooted in real life that it is sometimes difficult to distinguish between fact and fiction – just take ‘Juliet’s balcony‘. Although Shakespeare never visited Verona and his characters in Romeo & Juliet never existed, there is a 13th Century house in Verona where Juliet is said to have lived. It once belonged to the Capello family for many years. This house, a former inn, is now known as the Casa di Giulietta (Juliet’s House) and is one of Verona’s main tourist attractions. 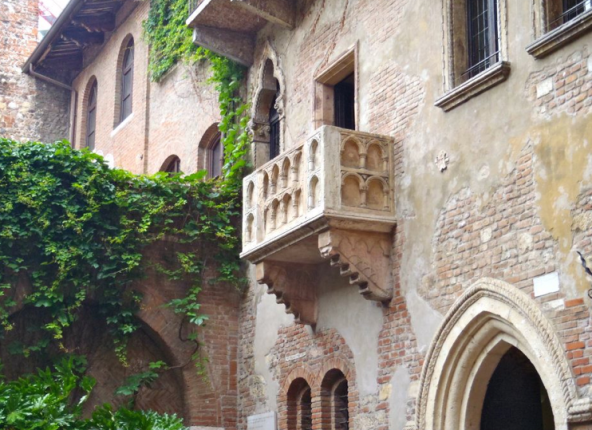 The combination of the similar name to Capulet and the fact that it has a balcony that looks out over a courtyard has turned it into ‘Juliet’ balcony’ – the actual balcony where Romeo and Juliet began to plan the events that led to their tragic deaths. 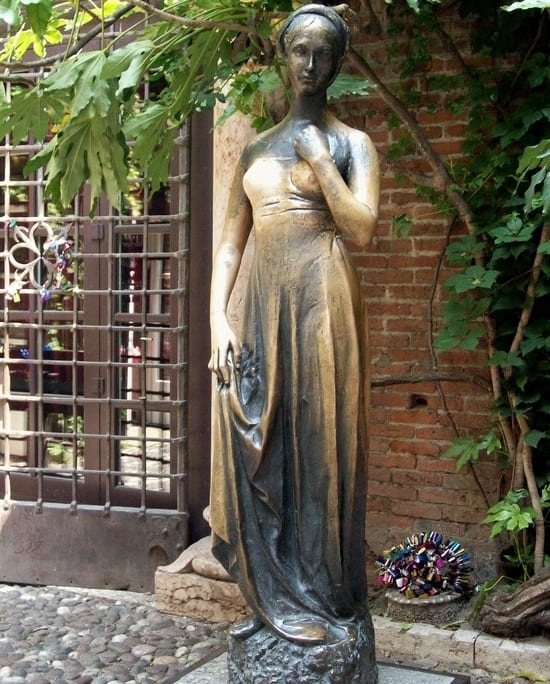 There is also a bronze statue of Juliet in the courtyard of Casa di Giulietta, proving that she did, indeed, exist! All tourists to Verona are steered to the site, and it’s particularly associated with honeymoon couples and young lovers. A tradition has developed that if they leave a message with their names on it Juliet will cast a lucky spell on them and their love will last for eternity. There’s a problem with this, however. 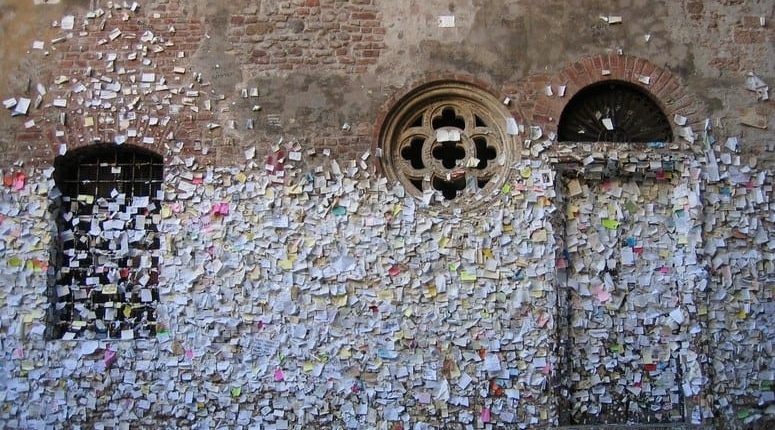 The lovers stick their notes on to the brick wall beneath Juliet’s balcony and usually use chewing gum. The house belongs to the World Heritage Trust, who are concerned about the unsightly mess of hardened blobs of gum and tattered scraps of paper that are defacing the building. The Verona city council have drawn up a decree banning the sticking of notes on the walls and also the consumption of food on the premises, but as a long tradition the Council are finding it difficult to suppress – even with a 500 Euro fine for anyone found sticking anything to the walls! In the meantime removable wooden panels are in place with an invitation to the lovers to post their messages there. One major problem with this article is that Shakespeare never used the word “balcony.” That word does not appear anywhere in any of his works. Juliet appears in her window. The balcony on “Juliet’s house” included with this article was added to that structure hundreds of years after the play.